A beautiful and mysterious alien from a conquered planet, Lunaria fled the conquest of her people, leaving behind both friends and family who had been enslaved by evil alien overlords. She was pursued through space and shot down over earth, crash-landing in Metrobay with her ship damaged beyond repair. There, she discovered the heroine Valor Girl being assaulted by the same evil aliens who had pursued her and she intervened to save the helpless heroines, forcing the aliens to flee and vow vengeance. Stranded on earth, she absorbed enough knowledge and language skills from Valor Girl to converse with the heroine, who offered her shelter and protection in gratitude for saving her. 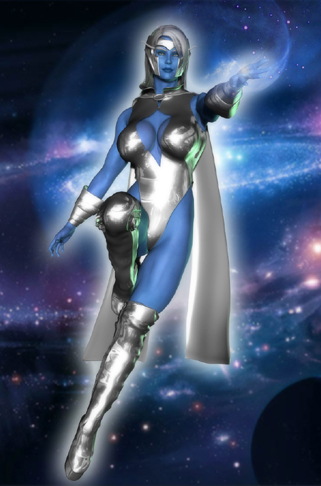 Lunaria thus joined the Superheroine Squad, intend on defending her adopted home from the same fate that befell her people. Lunaria hails from an alien race of empaths with the ability to absorb both knowledge, emotions, memories, and energy by touch alone. She describes this process as a “merging” of minds, where her mind becomes the dominant mind while those she merges with enter a sleep-like state allowing her to basically “share” a brain with another and obtain knowledge and experience of those she merges with. Inversely, she can assert dominant control over a merged mind, shutting it down, or forcing the body of her victim to do her bidding as an extension of her own will.